Indicate by check mark whether the registrant is a large accelerated filer, an accelerated filer, a non-accelerated filer, smaller reporting company, or an emerging growth company. See the definition of "large accelerated filer", "accelerated filer", "smaller reporting company" and "emerging growth company" in Rule 12b-2 of the Exchange Act. The aggregate market value of the voting and non-voting common equity held by non-affiliates on December 31, 2017, the last business day of the registrant’s most recently completed second fiscal quarter, based on the closing price on that date of $6.85 on the NYSE American was $127,161,941. The number of shares outstanding of the registrant's common stock, par value $0.001, as of September 4, 2018, was 33,171,514. Portions of the proxy statement related to the registrant's 2018 Annual Meeting of Stockholders to be filed within 120 days of the end of the fiscal year covered by this report are incorporated by reference into Part III of this report. This Form 10-K and the information referenced herein contain forward-looking statements within the meaning of the Private Securities Litigations Reform Act of 1995, Section 27A of the Securities Act of 1933 and Section 21E of the Securities Exchange Act of 1934. The words "plan," "expect," "project," "estimate," "assume," "believe," "anticipate," "intend," "budget," "forecast," "predict" and other similar expressions are intended to identify forward-looking statements. These statements appear in a number of places and include statements regarding our plans, beliefs or current expectations, including the plans, beliefs and expectations of our officers and directors. When considering any forward-looking statement, you should keep in mind the risk factors that could cause our actual results to differ materially from those contained in any forward-looking statement. Important factors that could cause actual results to differ materially from those in the forward-looking statements herein include the timing and extent of changes in commodity prices for oil and natural gas, operating risks and other risk factors as described in this Annual Report on Form 10-K as filed with the Securities and Exchange Commission ("SEC"). Furthermore, the assumptions that support our forward-looking statements are based upon information that is currently available and is subject to change. We specifically disclaim all responsibility to publicly update any information contained in a forward-looking statement or any forward-looking statement in its entirety and therefore disclaim any resulting liability for potentially related damages. All forward-looking statements attributable to Evolution Petroleum Corporation are expressly qualified in their entirety by this cautionary statement. We use the terms, "EPM," "Company," "we," "us" and "our" to refer to Evolution Petroleum Corporation, and unless the context otherwise requires, its wholly-owned subsidiaries. Evolution Petroleum Corporation is an oil and gas company focused on delivering a sustainable dividend yield to its shareholders through the ownership, management and development of producing oil and gas properties. The Company's long-term goal is to build a diversified portfolio of oil and gas assets primarily through acquisition, while seeking opportunities to maintain and increase production through selective development, production enhancement and other exploitation efforts on its properties. Our largest active investment is our interest in a CO2 enhanced oil recovery project in Louisiana's Delhi field. Our operations began in September 2003. In May 2004, our predecessor, Natural Gas Systems, Inc., merged into a wholly-owned subsidiary of Reality Interactive, Inc., an inactive public company, which was renamed Natural Gas Systems, Inc. ("NGS"). In connection with the listing of NGS shares on the American Stock Exchange (currently the NYSE American) in July 2006, NGS was renamed Evolution Petroleum Corporation. Our principal executive offices are located at 1155 Dairy Ashford Road, Suite 425, Houston, Texas 77079, and our telephone number is (713) 935-0122. We maintain a website at www.evolutionpetroleum.com, but information contained on our website does not constitute part of this document. Our common stock is traded on the NYSE American under the ticker symbol "EPM". At June 30, 2018, we had four full-time employees, not including contract personnel and outsourced service providers. None of the Company’s employees are currently represented by a union, and the Company believes that it has excellent relations with its employees. Our team is broadly experienced in oil and gas operations, development, acquisitions and financing. We follow a strategy of outsourcing most of our property accounting, human resources, administrative and other non-core functions. As a result of the retirement of Randy Keys, President and Chief Executive Officer on May 31, 2018, the Board of Directors immediately moved to name Robert Herlin to act as Interim Chief Executive Officer and to commence a search for a permanent Chief Executive Officer. Additionally, the Board of Directors created a temporary Transition Services Committee, consisting solely of Director William Dozier, to aid and assist management in primarily evaluating potential property acquisitions and operational matters. Both of these appointments are deemed temporary while the ongoing search for a permanent Chief Executive Officer is resolved. Evolution Petroleum Corporation is an oil and gas company focused on delivering a sustainable dividend yield to its shareholders through the ownership, management and development of producing oil and gas properties. The Company's long-term goal is to build a diversified portfolio of oil and gas assets primarily through acquisition, while seeking opportunities to maintain and increase production through selective development, production enhancement and other exploitation efforts on its properties. Our largest current asset is our interest in a CO2 enhanced oil recovery project in Louisiana's Delhi field. upon payout of the project, as defined in the purchase and sale agreements. Since EOR production began in March 2010, the Unit has produced over 17 million bbls of oil. A 23.9% working interest with an associated 19.0% net revenue interest. The working interest reverted to us effective November 1, 2014. Upon the occurrence of this contractual payout, we began bearing 23.9% of all operating expenses and capital expenditures. The above interests are separate and give us a combined net revenue interest of 26.2%. Our independent reservoir engineers, DeGolyer & MacNaughton, assigned the following estimated reserves net to our interests at Delhi as of June 30, 2018. Equivalent oil reserves are defined as six MCF of gas and 42 gallons of natural gas liquids to one barrel of oil conversion ratio. PV-10 of Proved reserves is a non-GAAP measure, reconciled to the Standardized Measure at "Estimated Oil and Natural Gas Reserves and Estimated Future Net Revenues" under Item 2. Properties of this Form 10-K. Both the Standardized Measure and PV-10 are based on the average first day of the month net commodity prices received at the Delhi field in the twelve months ending June 30, 2018, which were $57.50 per barrel of oil and $38.97 per barrel of natural gas liquids ("NGL"). Probable and possible reserves are not recognized under GAAP nor is there a comparable GAAP measure for probable and possible reserves. With respect to the above reserve numbers, and references to Probable and Possible reserves throughout this document, estimates of Probable and Possible reserves are inherently imprecise. When producing an estimate of the amount of oil and natural gas that is recoverable from a particular reservoir, Probable reserves are those additional reserves that are less certain to be recovered than Proved reserves and there must be at least a 50% probability that the actual quantities recovered will equal or exceed the Proved plus Probable reserve estimates. Possible reserves are even less certain and there must be at least a 10% probability that the actual quantities recovered will equal or exceed the sum of Proved, Probable and Possible reserve estimates. All categories of reserves are continually subject to revisions based on production history, results of additional exploration and development, price changes and other factors. Estimates of Probable and Possible reserves are by their nature much more speculative than estimates of Proved reserves and are subject to greater uncertainties, and accordingly the likelihood of recovering those reserves is subject to substantially greater risk. These three reserve categories have not been adjusted to different levels of recovery risk among these categories and are therefore not comparable and are not meaningfully combined. The operator originally planned six primary phases for the installation of the CO2 flood in the Delhi field. Four of these phases have been completed as of June 30, 2017 and two remain undeveloped. One of the remaining two phases (Phase V) is reflected as proved undeveloped in our current reserves report and the other was removed from proved reserves (Phase VI) as it was not deemed economic under current pricing guidelines for SEC purposes. Phase I began CO2 injection in November 2009. First oil production response occurred in March 2010 and production in the field increased to approximately 1,000 gross barrels of oil per day by December 2010. Implementation of Phase II, which was more than double the size of Phase I, commenced with incremental CO2 injection at the end of December 2010. First oil production response from Phase II occurred during March 2011, and field gross production increased to more than 4,000 barrels of oil per day by June 2011. Phase III was installed during calendar 2011, and was expanded twice during calendar 2011. Production subsequently increased to more than 5,000 gross barrels of oil per day. Phase IV was substantially installed during the first six months of calendar 2012. During early calendar 2013, the operator intensified development in the previously redeveloped western side of the field based on production results and new geological mapping that included the results of seismic data acquired over the last few years. Gross field production increased to more than 7,500 gross barrels of oil per day. In June 2013, following a fluid release event that consisted of the uncontrolled release of CO2, water, natural gas and a small amount of oil from a previously plugged well in the southwest part of the field, the operator temporarily suspended CO2 injection in most of the southwestern tip of the field. The operator has fully remediated the affected area, but has isolated that part of the field with a water curtain, thus removing that area from the CO2 flood. This fluid release event, along with other contractual disputes, caused the Company to file suit against the operator in December 2013. In June 2016, we reached a settlement with the operator as described in Note 21 – Delhi Field Litigation Settlement. Subsequent to the reversion of our working interest to us in November 2014, the operator initiated work on the Phase V expansion of the CO2 flood in the undeveloped eastern part of the field. This project is sometimes referred to as Test Site 5. These operations were suspended shortly after reversion when the operator made significant cuts in its capital budget as a result of declining oil prices. Resumption of this work has been electively delayed due to prevailing oil prices and the partners' allocation of capital to other Delhi projects, primarily the large investment in the NGL plant discussed below. It was further electively delayed based on the conclusion that the economics of the project would be improved if it were implemented after completion of the NGL plant, which has now occurred. We believe that the Phase V expansion of the CO2 flood has favorable economics, particularly in the current oil price environment, and we expect this project to expand the CO2 flood to resume within the next year. In February 2015, we began construction of an NGL recovery plant in the Delhi Field, which was completed and operational in December 2016. Our net cost for the NGL plant totaled $27 million, which included $0.3 million in September 2017 for capital upgrades to the inlet of recycle plant to bring output capacity up to its expected level. The NGL plant extracts methane and NGL's from the CO2 recycle stream. The methane and part of the ethane produced by the NGL plant are used to generate electrical power in the field. The extracted NGL's are sold at the field to a purchaser who transports them by truck to a plant for further processing. In addition to the value of these hydrocarbon products, the increased purity of the CO2 stream re-injected into the field should result in operational benefits to the CO2 flood. In March 2018, the operator began a planned twelve-well infill drilling program in the Delhi field. This program, which has an expected net cost to the Company of approximately $4.7 million, targets productive oil zones in the developed areas of the field that are not being swept effectively by the current CO2 flood. This infill program is expected to both add production and increase ultimate recoveries above the current proved producing oil reserves. Evolution's forecast for the remaining net cost to the Company for this project is approximately $1.9 million. In conjunction with the infill drilling program, the operator plans to drill the last two wells of a six-well water injection program on the eastern edge of the planned Phase V expansion of the Delhi field. The Company expects all of these projects to be completed by the end of calendar year 2018. In addition to the planned capital spending discussed above, the Company continues to identify and execute successful capital workover projects to improve conformance and production in the field. These projects are not individually material and are unlikely to have a significant impact on capital spending going forward. The operator has further identified other areas in the Delhi field for potential expansion of the CO2 flood, but the Company has not yet quantified any reserves with respect to such areas. We previously owned artificial lift technology registered as GARP® (Gas Assisted Rod Pump) that was developed internally by our former Senior Vice President of Operations. Its design is intended to increase production and extend the life of horizontal and vertical wells with gas, oil or associated water production with the expectation of recovering additional reserves at an economically attractive cost per BOE. We received a patent on our GARP® technology on August 30, 2011, which provides U.S. patent protection for the technology through early 2028. We have further filed for a continuation in part to our patent for recent improvements in the technology, including a concentric design which allows the technology to work in narrower diameter casing. Subsequent to receiving our patent, we entered into demonstration joint venture projects and commercialization projects with industry operators between 2012 and early 2015. Most of these projects were successful in establishing or restoring commercial rates of production. However, with the severe decline in oil prices that began in late 2014, a significant portion of these projects were not sufficiently profitable to justify continuation. revenues derived from the technology. We have the option to convert our preferred stock investment in Well Lift Inc, into a larger, non-controlling equity stake in the new entity. Consequently, we have retained upside for our shareholders from the potential future commercial success of the technology, while eliminating approximately $1.0 million of annual overhead expenses. We have also retained the right to use the technology in our current wells and any future wells we develop or acquire. In 2012, we acquired a 45% interest in a joint venture with Orion Exploration, a private company based in Tulsa, Oklahoma. The joint venture was operated by Orion and engaged in the horizontal development of the Mississippi Lime reservoir in Kay County, Oklahoma. Our leasehold position, totaling approximately 6,600 acres, was located in the eastern, more oil-prone side of the play. We drilled one gross salt water disposal well and reached total depth on two horizontally drilled wells in the Mississippi Lime formation. While both wells produced at the fluid rates expected, the quantities of oil and gas were far less than expected. We subsequently reworked both wells to test the role of structure in production, and determined that this play is a structural play requiring substantial geophysical and geological work and expertise in order to be successful, as opposed to a resource play in which engineering is the primary requirement. Accordingly, we elected in fiscal 2013 to reduce our joint venture interest in undeveloped leases to 33.9%, resulting in a $1.2 million reduction in both our net property and accounts payable. In October 2014, we completed the sale of all of our leasehold interests and wells and any associated assets and abandonment liabilities in the Mississippi Lime reservoir to the operator. We market our production to third parties in a manner consistent with industry practices. In the U.S. market where we operate, crude oil and natural gas liquids are readily transportable and marketable. We do not currently market our share of crude oil production from Delhi separately from the operator's share of production. Although we have the right to take our working interest production in-kind, we are currently selling our oil under the Delhi operator's agreement with Plains Marketing L.P. pursuant to the delivery and pricing terms thereunder. The oil from Delhi is currently transported from the field by pipeline, which results in better net pricing than the alternative of transportation by truck. Delhi crude oil production sells at Louisiana Light Sweet ("LLS") pricing which generally trades at a premium to West Texas Intermediate ("WTI") crude oil pricing. The positive LLS Gulf Coast average price differential over WTI, as quoted daily on the New York Mercantile Exchange ("NYMEX"), was approximately $3.82 per barrel during our fiscal year ended June 30, 2018. The differential has increased from the prior year and we expect that a positive LLS price differential will continue, at least in the near future. Our overall average net oil price, including the LLS premium and after all adjustments for transportation, marketing and other price differentials, was $0.30 per barrel more than the average WTI NYMEX price for fiscal 2018. Upon completion of the NGL plant in late 2016, we began selling natural gas liquids from the Delhi field to American Midstream Gas Solutions, L.P. Title to these products is transferred to the purchaser at the field and they are transported by truck to the purchaser's processing facility. We receive market prices, less transportation, processing and quality differential fees for the net yield of the individual natural gas liquid components, consisting of propane, butanes, and C5+ (pentanes and heavier components). There is a small component of residual ethane, but the overall yield of products is a higher value mix than is typical for natural gas liquids. The loss of our purchaser at the Delhi field or disruption to pipeline transportation from the field could adversely affect our net realized pricing and potentially our near-term production levels. The loss of any of our other purchasers would not be expected to have a material adverse effect on our operations. Marketing of crude oil, natural gas, and natural gas liquids and the prices we receive are influenced by many factors that are beyond our control, the exact effect of which is difficult to predict. These factors include changes in supply and demand, market prices, government regulation and actions of major foreign producers. Over the past 30 years, crude oil price fluctuations have been extremely volatile, with crude oil prices varying from less than $10 to over $140 per barrel. More recently, the price of oil per barrel dropped dramatically, starting in the fourth quarter of 2014 and continuing into 2017 before recovering somewhat in 2018. Worldwide factors such as geopolitical, macroeconomic, supply and demand, refining capacity, petrochemical production and derivatives trading, among others, influence prices for crude oil. Local factors also influence prices for crude oil and include increasing or decreasing production trends, quality differences, regulation and transportation issues unique to certain producing regions and reservoirs. Also over the past 30 years, domestic natural gas prices have been extremely volatile, ranging from $1 to $15 per MMBTU. The spot market for natural gas, changes in supply and demand, derivatives trading, pipeline availability, BTU content of the natural gas and weather patterns, among others, cause natural gas prices to be subject to significant fluctuations. Due to the practical difficulties in transporting natural gas, local and regional factors tend to influence product prices more for natural gas than for crude oil. The oil and natural gas industry is highly competitive for prospects, acreage and capital. Our competitors include major integrated crude oil and natural gas companies and numerous independent crude oil and natural gas companies, individuals and drilling and income programs. Many of our competitors are large, well-established companies with substantially larger operating staffs and greater capital resources than ours. Competitors are national, regional or local in scope and compete on the basis of financial resources, technical prowess or local knowledge. The principal competitive factors in our industry are expertise in given geographical and geological areas and the abilities to efficiently conduct operations, achieve technological advantages, identify, acquire economically producible reserves and obtain capital at rates which allow economic investments. For a discussion of seasonal changes that affect our business, see Item 7. Management's Discussion and Analysis of Financial Condition and Results of Operations - Other Economic Factors - Seasonality in this Form 10-K. Numerous federal and state laws and regulations govern the oil and gas industry. These laws and regulations are often changed in response to changes in the political or economic environment. Compliance with this evolving regulatory burden is often difficult and costly, and substantial penalties may be incurred for noncompliance. To the best of our knowledge, we are in compliance with all laws and regulations applicable to our operations and we believe that continued compliance with existing requirements will not have a material adverse impact on us. The future annual capital cost of complying with the regulations applicable to our operations is uncertain and will be governed by several factors, including future changes to regulatory requirements which are unpredictable. However, we do not currently anticipate that future compliance with existing laws and regulations will have a materially adverse effect on our consolidated financial position or results of operations. See "Government regulation and liability for environmental matters that may adversely affect our business and results of operations" under Item 1A. Risk Factors of this Form 10-K, for additional information regarding government regulation. We maintain insurance on our operated and non-operated properties and operations for risks and in amounts customary in the industry. Such insurance includes general liability, excess liability, control of well, operators extra expense, casualty, fraud and directors & officer's liability coverage. Not all losses are insured, and we retain certain risks of loss through deductibles, limits and self-retentions. We do not carry lost profits coverage and we do not have coverage for consequential damages. We file Annual Reports on Form 10-K, Quarterly Reports on Form 10-Q, Current Reports on Form 8-K and other reports with the Securities and Exchange Commission ("SEC") . Our reports filed with the SEC are available free of charge to the general public through our website at www.evolutionpetroleum.com. These reports are accessible on our website as soon as reasonably practicable after being filed with, or furnished to, the SEC. This Annual Report on Form 10-K and our other filings can also be obtained by contacting: Corporate Secretary, 1155 Dairy Ashford Road, Suite 425, Houston, Texas 77079, or calling (713) 935-0122. These reports are also available at the SEC Public Reference Room at 450 Fifth Street, N.W., Washington, D.C. 20549. The public may obtain information on the operation of the Public Reference Room by calling the SEC at 1-800-SEC-0330. The SEC also maintains a website at www.sec.gov that contains reports, proxy and information statements and other information regarding issuers that file electronically with the SEC. Our business involves a high degree of risk. If any of the following risks, or any risk described elsewhere in this Annual Report on Form 10-K, actually occurs, our business, financial condition or results of operations could suffer. The risks described below are not the only ones facing us. Additional risks not presently known to us or which we currently consider to be immaterial also may adversely affect us. A substantial or extended decline in oil prices may adversely affect our business, financial condition or results of operations and our ability to meet our capital expenditure obligations and financial commitments. Substantially all of our production is sold to purchasers under short-term (less than twelve-month) contracts at market-based prices. A decline in oil and natural gas liquids prices will reduce our cash flows, borrowing ability, the present value of our reserves and our ability to develop future reserves. We may be unable to obtain needed capital or financing on satisfactory terms. Low oil and natural gas liquids prices may also reduce the amount of oil and natural gas liquids that we can produce economically, which could lead to a decline in our oil and natural gas liquids reserves. Because approximately 86% of our proved reserves at June 30, 2018 are crude oil reserves and 14% are natural gas liquids reserves, we are heavily impacted by movements in crude oil prices, which also influence natural gas liquids prices. To the extent that we have not hedged our production with derivative contracts or fixed-price contracts, any significant and extended decline in oil and natural gas liquids prices may adversely affect our financial position. Our revenues are concentrated in one asset and related declines in production or other events beyond our control could have a material adverse effect on our results of operations and financial results. Substantially all of our revenues come from our royalty, mineral and working interests in the Delhi field in Louisiana and thus our current revenues are highly concentrated in this field. Any significant downturn in production, oil and gas prices, or other events beyond our control which impact the Delhi field could have a material adverse effect on our results of operations and financial results. We are not the operator of the Delhi field, and our revenues and future growth are heavily dependent on the success of operations, which we do not control. Operating results from oil and natural gas production may decline; we may be unable to acquire and develop the additional oil and natural gas reserves that are required in order to sustain our business operations. In general, the volumes of production from crude oil and natural gas properties decline as reserves are depleted, with the rate of decline depending on reservoir characteristics. Except to the extent we acquire additional properties containing proved reserves or conduct successful development activities, or both, our proved reserves will decline. Our production is heavily dependent on our interests in EOR production that began during March 2010 in the Delhi field. Environmental or operating problems or lack of future investment at Delhi could cause our net production of oil and natural gas liquids to decline significantly over time, which could have a material adverse effect on our financial condition. Substantially all of our property interests are not operated by the Company and also involve other third-party working interest owners. As a result, we have limited ability to influence or control the operation or future development of such properties, including compliance with environmental, safety and other regulations, or the amount of capital expenditures that we will be required to fund with respect to such properties. Operators of these properties may act in ways that are not in our best interest. Moreover, we are dependent on the other working interest owners of such projects to fund their contractual share of the capital expenditures of such projects. These limitations and our dependence on the operator and other working interest owners for these projects could cause us to incur unexpected future costs, result in lower production and materially and adversely affect our financial conditions and results of operations. We are materially dependent upon our operator with respect to the successful operation of our principal asset, which consists of our interests the Delhi field. A materially negative change in our operator’s financial condition could negatively affect operations (or timing thereof) in the Delhi field, and consequently our income (or timing thereof) from the field as well as the value of our interests in the Delhi field. Our royalty, mineral and working interests in the Delhi field, located in Northeast Louisiana, currently represent our sole producing asset. Over 99% of our revenues come from these interests and thus our current revenues are highly concentrated in this field. Any significant downturn in production or other events beyond our control which impact the Delhi field could have a material adverse effect on our results of operations and financial results (or timing thereof). We are not the operator of the Delhi field. It is operated by a subsidiary of Denbury Resources Inc. (“DNR”). Our revenues and future growth are thus heavily dependent on the success of operations which we do not control. Further, our CO2 - Enhanced Oil Recovery (“CO2-EOR”) project in the Delhi field requires significant amounts of CO2 reserves and technical expertise, the sources of which have been committed by the operator. Additional capital remains to be invested to fully develop this project, further increase production and maximize the value of this asset. The operator's failure to manage these and other technical, environmental, operating, strategic, financial and logistical matters could cause ultimate enhanced recoveries from the planned CO2 - EOR project to fall short of our expectations in volume and/or timing. Such occurrences could have a material adverse effect on us, and our results of operations and financial condition. Our economic success is thus materially dependent upon the Delhi field operator's ability to: (i) deliver sufficient quantities of CO2 from its reserves in the Jackson Dome source, (ii) secure its share of capital necessary to fund development and operating commitments with respect to the field and (iii) successfully manage related technical, operating, environmental, strategic and logistical risks, among other things. We are aware that DNR, which is publicly traded, has disclosed in its public SEC filings certain risks related to its current level of indebtedness and the related financial covenants. They have stated, for example, that their level of indebtedness could have important consequences, including, among others, requiring dedication of a substantial portion of DNR’s cash flow from operations to servicing their indebtedness. They noted that their ability to meet their obligations under their debt instruments will depend in part upon prevailing economic conditions and commodity prices. DNR also noted that it has from time to time deferred development spending for certain projects. Given the current stress in the global commodity markets and oil and gas in particular, our operator could be materially negatively impacted, which could in turn negatively affect the operator’s ability to operate the Delhi field as well as its financial commitment to the CO2-EOR project in the field, and thus our interests in the Delhi field could be materially negatively impacted. The types of resources we focus on have substantial operational risks. Our business plan focuses on the acquisition and development of known resources in partially depleted reservoirs, naturally fractured or low permeability reservoirs, or relatively shallow reservoirs. Shallower reservoirs usually have lower pressure, which generally translates into lower reserve volumes in place. Low permeability reservoirs require more wells and substantial stimulation for development of commercial production. Naturally fractured reservoirs require penetration of sufficient undepleted fractures to establish commercial production. Depleted reservoirs require successful application of newer technology to unlock incremental reserves. planned CO2-EOR project to fall short of our expectations in volume and/or timing. Such occurrences would have a material adverse effect on the Company, its results of operations and financial condition. Crude oil and natural gas development, re-completion of wells from one reservoir to another reservoir, restoring wells to production and drilling and completing new wells are speculative activities and involve numerous risks and substantial uncertain costs. shortages or delays in the availability of drilling rigs or crews and the delivery of equipment. Drilling or re-working is a highly speculative activity. Even when fully and correctly utilized, modern well completion techniques such as horizontal drilling or CO2 injection or other injectants do not guarantee that we will find and produce crude oil and/or natural gas in our wells in economic quantities. Our future drilling activities may not be successful and, if unsuccessful, such failure would have an adverse effect on our future results of operations and financial condition. We cannot assure you that our overall drilling success rate or our drilling success rate for activities within a particular geographic area will not decline. We may also identify and develop prospects through a number of methods, some of which do not include horizontal drilling or tertiary injectants, and some of which may be unproven. The drilling and results for these prospects may be particularly uncertain. We cannot assure you that these projects can be successfully developed or that the wells discussed will, if drilled, encounter reservoirs of commercially productive crude oil or natural gas. The loss of a large single purchaser of our oil and natural gas could reduce the competition of our production. For the year ended June 30, 2018, one purchaser accounted for 92% of our oil and natural gas liquid revenues. We do not currently market our share of crude oil production from the Delhi field. Although we have the right to take our working interest production in-kind, we are currently accepting terms under the Delhi operator's agreement with Plains Marketing L.P. for the delivery and pricing of our oil at the field. The loss of such large single purchaser for our oil and natural gas production could negatively impact the revenue we receive. We cannot assure you we could readily find other purchasers for our oil and natural gas production. In addition, the crude oil production from the Delhi field is transported by pipeline and if this pipeline transportation were disrupted and we were forced to use alternative transportation methods, our net realized pricing and potentially our near-term production levels could be adversely affected. Our crude oil and natural gas reserves are only estimates and may prove to be inaccurate. There are numerous uncertainties inherent in estimating crude oil and natural gas reserves and their estimated values. Our reserves are only estimates that may prove to be inaccurate because of these uncertainties. Reservoir engineering is a subjective and inexact process of estimating underground accumulations of crude oil and natural gas that cannot be measured in an exact manner. Estimates of economically recoverable crude oil and natural gas reserves depend upon a number of variable factors, such as historical production from the area compared with production from other producing areas and assumptions concerning effects of regulations by governmental agencies, future crude oil and natural gas product prices, future operating costs, severance and excise taxes, development costs and work-over and remedial costs. Some or all of these assumptions may vary considerably from actual results. For these reasons, estimates of the economically recoverable quantities of crude oil and natural gas attributable to any particular group of properties, classifications of such reserves based on risk of recovery, and estimates of the future net cash flows expected therefrom prepared by different engineers or by the same engineers but at different times, may vary substantially. estimated crude oil and natural gas reserves attributable to our properties. The estimated discounted future net cash flows from proved reserves are based on the 12-month average price, calculated as the unweighted arithmetic average of the first-day-of-the-month price for each month within the 12-month period prior to the end of the reporting period, and costs as of the date of the estimate, while actual future prices and costs may be materially higher or lower. Actual future net cash flows also will be affected by factors such as the amount and timing of actual production, supply and demand for crude oil and natural gas, increases or decreases in consumption, and changes in governmental regulations or taxation. In addition, the 10% discount factor, which is required by the SEC to be used in calculating discounted future net cash flows for reporting purposes, is not necessarily the most appropriate discount factor based on interest rates in effect from time to time and risks associated with us or the crude oil and natural gas industry in general. The Standardized Measure and PV-10 do not necessarily correspond to market value. Regulatory and accounting requirements may require substantial reductions in reporting proven reserves. We review on a periodic basis the carrying value of our crude oil and natural gas properties under the applicable rules of the various regulatory agencies, including the SEC. Under the full cost method of accounting that we use, the after-tax carrying value of our oil and natural gas properties may not exceed the present value of estimated future net after-tax cash flows from proved reserves, discounted at 10%. Application of this "ceiling" test requires pricing future revenues at the previous 12-month average beginning-of-month price and requires a write down of the carrying value for accounting purposes if the ceiling is exceeded. We may in the future be required to write down the carrying value of our crude oil and natural gas properties when crude oil and natural gas prices are depressed or unusually volatile. Whether we will be required to take such a charge will depend in part on the prices for crude oil and natural gas during the previous period and the effect of reserve additions or revisions and capital expenditures during such period. If a write down is required, it would result in a current charge to our earnings but would not impact our current cash flow from operating activities. A large write-down could adversely affect our compliance with the current financial covenants under our credit facility and could limit our access to future borrowings under that facility or require repayment of any amounts that might be outstanding at the time. Our derivative activities could result in financial losses or could reduce our income. there is a change in the expected differential between the underlying price in the derivative instrument and actual price received. In addition, some of these types of derivative arrangements limit the benefit we would receive from increases in the prices for oil and natural gas liquids and may expose us to cash margin requirements. We may have difficulty managing future growth and the related demands on our resources and may have difficulty in achieving future growth. successfully manage technical, operating, environmental, strategic and logistical development and operating risks, and (iii) maintain its own financial stability, among other things. We cannot assure you that we will be able to successfully grow or manage any such growth. Our operations may require significant amounts of capital and additional financing may be necessary in order for us to continue our exploitation activities, including meeting potential future drilling obligations. Our cash flow from our reserves may not be sufficient to fund our ongoing activities at all times. From time to time, we may require additional financing in order to carry out our oil and gas acquisitions, exploitation and development activities. Certain of our undeveloped leasehold acreage may be subject to leases that will expire unless production is established. If our revenues from our reserves decrease as a result of lower oil and natural gas prices or otherwise, it will affect our ability to expend the necessary capital to replace our reserves or to maintain our current production. If our cash flow from operations is not sufficient to satisfy our capital expenditure requirements, there can be no assurance that additional debt or equity financing will be available to meet these requirements or available to us on favorable terms. We may be subject to risks in connection with acquisitions because of uncertainties in evaluating recoverable reserves, well performance and potential liabilities, as well as uncertainties in forecasting oil and gas prices and future development, production and marketing costs, and the integration of significant acquisitions may be difficult. potential environmental issues, litigation and other liabilities. The accuracy of these assessments is inherently uncertain. In connection with these assessments, we perform a review of the subject properties that we believe to be generally consistent with industry practices. Our review will not reveal all existing or potential problems nor will it permit us to become sufficiently familiar with the properties to fully assess their deficiencies and potential recoverable reserves. Inspections may not always be performed on every well, and environmental problems are not necessarily observable even when an inspection is undertaken. Even when problems are identified, the seller may be unwilling or unable to provide effective contractual protection against all or part of the problems. Moreover, in the event of such an acquisition, there is a risk that we could ultimately be liable for unknown obligations related to acquisitions, which could materially adversely affect our financial condition, results of operations or cash flows. the challenge of attracting and retaining personnel associated with acquired operations. The process of integrating assets could cause an interruption of, or loss of momentum in, the activities of our business. Members of our senior management may be required to devote considerable amounts of time to this integration process, which will decrease the time they will have to manage our business. If our senior management is not able to effectively manage the integration process, or if any significant business activities are interrupted as a result of the integration process, our business could suffer. In addition, even if we successfully integrate the assets acquired in an acquisition, it may not be possible to realize the full benefits we may expect in estimated proved reserves, production volumes, cost savings from operating synergies or other benefits anticipated from an acquisition or realize these benefits within the expected time frame. Government regulation and liability for environmental matters may adversely affect our business and results of operations. Crude oil and natural gas operations are subject to extensive federal, state and local government regulations, which may be changed from time to time. Matters subject to regulation include discharge permits for drilling operations, drilling bonds, reports concerning operations, the spacing of wells, unitization and pooling of properties and taxation. From time to time, regulatory agencies have imposed price controls and limitations on production by restricting the rate of flow of crude oil and natural gas wells below actual production capacity in order to conserve supplies of crude oil and natural gas. There are federal, state and local laws and regulations primarily relating to protection of human health and the environment applicable to the development, production, handling, storage, transportation and disposal of crude oil and natural gas, by-products thereof, the emission of CO2 or other greenhouse gases, and other substances and materials produced or used in connection with crude oil and natural gas operations. In addition, we may inherit liability for environmental damages, whether actual or not, caused by previous owners of property we purchase or lease or nearby properties. As a result, we may incur substantial liabilities to third parties or governmental entities. We are also subject to changing and extensive tax laws, the effects of which cannot be predicted. The implementation of new, or the modification of existing, laws or regulations could have a material adverse effect on us, such as diminishing the demand for our products through legislative enactment of proposed new penalties, fines and/or taxes on carbon that could have the effect of raising prices to the end user. Our insurance may not protect us against all of the operating risks to which our business is exposed. The crude oil and natural gas business involves numerous operating hazards such as well blowouts, mechanical failures, explosions, uncontrollable flows of crude oil, natural gas or well fluids, fires, formations with abnormal pressures, hurricanes, flooding, pollution, releases of toxic gas and other environmental hazards and risks, which can result in (i) damage to or destruction of wells and/or production facilities, (ii) damage to or destruction of formations, (iii) injury to persons, (iv) loss of life, or (v) damage to property, the environment or natural resources. While we carry general liability, control of well, and operator's extra expense coverage typical in our industry, we are not fully insured against all risks incidental to our business. Environmental events similar to that experienced in the Delhi field in June 2013 could defer revenue, increase operating costs and/or increase maintenance and repair capital expenditures. The loss of key personnel could adversely affect us. We depend to a large extent on the services of certain key management personnel, including our executive officers, the loss of any of whom could have a material adverse effect on our operations. In particular, our future success is dependent upon the abilities of Robert S. Herlin, our Chairman of the Board and Interim Chief Executive Officer, R. Steven Hicks, our Senior Vice President of Engineering and Business Development, and David Joe, Senior Vice President, Chief Financial Officer and Treasurer, to source, evaluate and close deals, raise capital, and oversee our development activities and operations. Presently, the Company is not a beneficiary of any key man life insurance. Oil field service and materials' prices may increase, and the availability of such services and materials may be inadequate to meet our needs. Our business plan to develop or redevelop crude oil and natural gas resources requires third party oilfield service vendors and various material providers, which we do not control. We also rely on third-party carriers for the transportation and distribution of our production. As our production increases, so does our need for such services and materials. Generally, we do not have long-term agreements with our service and materials providers. Accordingly, there is a risk that any of our service providers could discontinue servicing our crude oil and natural gas fields for any reason or we may not be able to source the materials we need. Any delay in locating, establishing relationships, and training our sources could result in production shortages and maintenance problems, with a resulting loss of revenue to us. In addition, if costs for such services and materials increase, it may render certain or all of our projects uneconomic, as compared to the earlier prices we may have assumed when deciding to redevelop newly purchased or existing properties. Further adverse economic outcomes may result from the long lead times often necessary to execute and complete our redevelop plans. We cannot market the crude oil and natural gas that we produce without the assistance of third parties. The marketability of the crude oil and natural gas that we produce depends upon the proximity of our reserves to, and the capacity of, facilities and third-party services, including crude oil and natural gas gathering systems, pipelines, trucking or terminal facilities, and processing facilities necessary to make the products marketable for end use. The unavailability or lack of capacity of such services and facilities could result in the shut-in of producing wells or the delay or discontinuance of development plans for properties. A shut-in or delay or discontinuance could adversely affect our financial condition. We face strong competition from larger oil and gas companies. Our competitors include major integrated crude oil and natural gas companies and numerous independent crude oil and natural gas companies, individuals and drilling and income programs. Many of our competitors are large, well-established companies with substantially larger operating staffs and greater capital resources than ours. We may not be able to successfully conduct our operations, evaluate and select suitable properties and consummate transactions in this highly competitive environment. Specifically, these larger competitors may be able to pay more for development projects and productive crude oil and natural gas properties and may be able to define, evaluate, bid for and purchase a greater number of properties and prospects than our financial or human resources permit. In addition, such companies may be able to expend greater resources on hiring contract service providers, obtaining oilfield equipment and acquiring the existing and changing technologies that we believe are and will be increasingly important to attaining success in our industry. We have been, and in the future may become, involved in legal proceedings related to our Delhi interest or other properties or operations and, as a result, may incur substantial costs in connection with those proceedings. From time to time we may be a defendant or plaintiff in various lawsuits. The nature of our operations exposes us to further possible litigation claims in the future. There is risk that any matter in litigation could be decided unfavorably against us regardless of our belief, opinion, and position, which could have a material adverse effect on our financial condition, results of operations, and cash flow. Litigation can be very costly, and the costs associated with defending litigation could also have a material adverse effect on our financial condition. Adverse litigation decisions or rulings may damage our business reputation. Ownership of our oil, gas and mineral production depends on good title to our property. Good and clear title to our oil, gas and mineral properties is important to our business. Although title reviews will generally be conducted prior to the purchase of most oil, gas and mineral producing properties or the commencement of drilling wells, such reviews do not assure that an unforeseen defect in the chain of title will not arise to defeat our claim which could result in a reduction or elimination of the revenue received by us from such properties. Poor general economic, business, or industry conditions may have a material adverse effect on our results of operations, liquidity, and financial condition. During the last few years, concerns over inflation, energy costs, declining oil and gas prices, geopolitical issues, the availability and cost of credit, the U.S. mortgage market, uncertainties with regard to European sovereign debt, the slowdown in economic growth in large emerging and developing markets, such as China, regional or worldwide increases in tariffs or other trade restrictions, and other issues have contributed to increased economic uncertainty and diminished expectations for the global economy. Concerns about global economic conditions have had a significant adverse impact on domestic and international financial markets and commodity prices. If uncertain or poor economic, business or industry conditions in the United States or abroad remain prolonged, demand for petroleum products could diminish or stagnate, production costs could increase, any of which could impact the price at which we can sell our oil, natural gas, and NGLs, affect our vendors', suppliers' and customers' ability to continue operations, and ultimately adversely impact our results of operations, liquidity, and financial condition. general economic, political and market conditions. Our executive officers, directors and affiliates may be able to control the election of our directors and all other matters submitted to our stockholders for approval. As of June 30, 2018 our executive officers and directors, in the aggregate, beneficially owned approximately 2.6 million shares, or approximately 7.9% of our beneficial common stock base. JVL Advisors LLC controlled approximately 3.6 million shares or approximately 10.1% of our outstanding common stock. ArrowMark Colorado Holdings LLC controlled approximately 2.3 million shares, or approximately 6.9% of our outstanding common stock. Advisory Research, Inc. controlled approximately 2.5 million shares, or approximately 7.5% of our outstanding common stock and Blackrock Fund Advisors controlled approximately 2.2 million shares, or approximately 6.5% of our outstanding common stock. As a result, any of these holders could potentially exercise significant influence over matters submitted to our stockholders for approval (including the election and removal of directors and any merger, consolidation or sale of all or substantially all of our assets). This concentration of ownership may have the effect of delaying, deferring or preventing a change in control of our company, impede a merger, consolidation, takeover or other business combination involving our company or discourage a potential acquirer from making a tender offer or otherwise attempting to obtain control of our company, which in turn could have an adverse effect on the market price of our common stock. The market for our common stock is limited and may not provide adequate liquidity. Our common stock trades on the NYSE American. Our trading volume decreased in fiscal 2018 compared to fiscal 2017. Trading volume in our common stock is relatively low compared to larger companies. During the fiscal year ended June 30, 2018, the daily trading volume in our common stock ranged from a low of 20,600 shares to a high of 807,500 shares, with average daily trading volume of 112,015 shares compared to average daily volume of 127,419 in fiscal 2017. Our holders may find it more difficult to sell their shares, should they desire to do so, based on the trading volume and price of our stock at that time relative to the quantity of shares to be sold. If securities or industry analysts do not publish research reports about our business, or if they downgrade our stock, the price of our common stock could decline. Small, relatively unknown companies can achieve visibility in the trading market through research and reports that industry or securities analysts publish. To our knowledge there are four independent analysts that cover our company. The limited number of published reports by independent securities analysts could limit the interest in our common stock and negatively affect our stock price. We do not have any control over the research and reports these analysts publish or whether they will be published at all. If any analyst who does cover us downgrades our stock, our stock price could decline. If any analyst ceases coverage of our company or fails to regularly publish reports on us, we could lose visibility in the financial markets, which in turn could cause our stock price to decline. The issuance of additional common stock and preferred stock could dilute existing stockholders. discouraging bids for our common stock. Continued payment of dividends on our common stock could be impacted. Our Board of Directors declared cash dividends on our common stock for the first time in December 2013 and we have declared and paid quarterly cash dividends since that time. However, there is no certainty that dividends will be declared by the Board of Directors in the future. Any payment of cash dividends on our common stock in the future will be dependent upon the amount of funds legally available, our earnings, if any, our financial condition and business plan, restrictions contained in current or future debt instruments, contractual covenants or arrangements we may enter into, our anticipated capital requirements and other factors that our board of directors may think are relevant. Accordingly, there is no guarantee that we will be able or choose to continue to pay cash dividends on our common stock. Additional detailed information describing the types of properties we own can be found in "Business Strategy" under Item 1. Business of this Form 10-K. The SEC sets rules related to reserve estimation and disclosure requirements for oil and natural gas companies. These rules require disclosure of oil and gas proved reserves by significant geographic area, using the trailing 12-month average price, calculated as the unweighted arithmetic average of the first-day-of-the-month price for each month within the 12-month period prior to the end of the reporting period, rather than year-end prices, and allows the use of new technologies in the determination of proved reserves if those technologies have been demonstrated empirically to lead to reliable conclusions about reserve volumes. Subject to limited exceptions, the rules also require that proved undeveloped reserves may only be classified as such if a development plan has been adopted indicating that they are scheduled to be drilled within five years. There are numerous uncertainties inherent in estimating quantities of proved reserves and estimates of reserves quantities and values must be viewed as being subject to significant change as more data about the properties becomes available. Estimates of Probable and Possible reserves are inherently imprecise. When producing an estimate of the amount of oil and natural gas liquids that is recoverable from a particular reservoir, Probable reserves are those additional reserves that are less certain to be recovered than Proved reserves but which, together with Proved reserves, are as likely as not to be recovered, generally described as having a 50% probability of recovery of that amount or more. Possible reserves are even less certain and generally require only a 10% or greater probability of that amount or more being recovered. All categories of reserves are continually subject to revisions based on production history, results of additional exploration and development, price changes and other factors. Estimates of Probable and Possible reserves are by their nature much more speculative than estimates of Proved reserves and are subject to greater uncertainties, and accordingly the likelihood of recovering those reserves is subject to substantially greater risk. These three reserve categories have not been adjusted to different levels of recovery risk among these categories and are therefore not comparable and are not meaningfully combined. Estimated pre-tax future net revenues from the production of Proved reserves discounted at 10%, or PV-10, is a financial measure that is not recognized by GAAP. We believe that the presentation of the non-GAAP financial measure of PV-10 provides useful information to investors because it is widely used by analysts and investors in evaluating oil and natural gas companies, and that it is relevant and useful for evaluating the relative monetary significance of oil and natural gas properties. Further, analysts and investors may utilize the measure as a basis for comparison of the relative size and value of our reserves to other companies' reserves. We also use this pre-tax measure when assessing the potential return on investment related to oil and natural gas properties and in evaluating acquisition opportunities. Because there are many unique factors that can impact an individual company when estimating the amount of future income taxes to be paid, we believe the use of a pre-tax measure is valuable for evaluating our Company. PV-10 is not a measure of financial or operating performance under GAAP, nor is it intended to represent the current market value of our estimated oil and natural gas reserves. PV-10 should not be considered in isolation or as a substitute for the Standardized Measure as defined under GAAP, and reconciled herein this Item 2. Properties. Our proved, probable and possible reserves at June 30, 2018, denominated in equivalent barrels using six MCF of gas and 42 gallons of natural gas liquids to one barrel of oil conversion ratio, were estimated by our independent petroleum engineer, DeGolyer and MacNaughton ("D&M"). D&M was selected to estimate reserves for our interests in the Delhi field due to their expertise in CO2-EOR projects and to ensure consistency with the operator. The scope and results of their procedures are summarized in a letter from the firm, which is included as exhibit 99.1 to this Annual Report on Form 10-K. The following table sets forth our estimated proved, probable and possible reserves as of June 30, 2018. For additional reserve information see Note 23 – Supplemental Disclosures about Oil and Natural Gas Producing Properties (Unaudited) of the consolidated financial statements. The NYMEX previous 12-month unweighted arithmetic average first-day-of-the-month price used to calculate estimated revenues was $57.50 per barrel of crude oil. The net price per barrel of natural gas liquids was $38.97, which does not have any single comparable reference index price. The NGL price was based on historical prices received. For periods for which no historical price information was available, we used comparable pricing in the area. Pricing differentials were applied based on quality, processing, transportation, location and other pricing aspects for each individual property and product. *BOE computed on units of production using a six to one conversion ratio of MCF's to barrels. The following tables present a reconciliation of changes in our proved, probable and possible reserves by major property, on the basis of equivalent MBOE quantities. The following table provides a reconciliation of PV-10 of our proved properties to the Standardized Measure as shown in Note 23 – Supplemental Disclosures about Oil and Natural Gas Producing Properties (Unaudited) of the consolidated financial statements. Our sole producing assets as of June 30, 2018 and 2017 were our interests in the Delhi field. Additional information about the properties we own can be found in Item 1. Business. Our policies regarding internal controls over reserves estimates require such estimates to be prepared by an independent engineering firm under the supervision of our Chairman of the Board and interim Chief Executive Officer and Senior Vice President of Engineering and Business Development, a professional petroleum engineer. Such reserves estimates are to be in compliance with generally accepted petroleum engineering and evaluation principles and definitions and guidelines established by the SEC. Our Chairman of the Board and interim Chief Executive Officer holds B.S. and M.E. degrees from Rice University in chemical engineering and earned an M.B.A. from Harvard University. He has over 30 years of experience in engineering, energy transactions, operations and finance with small independents, larger independents and major integrated oil companies. Our Senior Vice President of Engineering and Business Development received Bachelor of Science degree in petroleum engineering from the University of Oklahoma in 1979 and has over 39 years of experience in the energy industry with upstream oil and gas companies. Our outside consultant who assisted the Company in preparing its reserves estimates is a licensed professional engineer with over 30 years of experience in oil and gas operations and petroleum reservoir engineering and holds a Bachelor of Science in Petroleum Engineering from Texas A&M University. The reserves information in this filing is based on estimates prepared by DeGolyer and MacNaughton, our independent engineering firm. The person responsible for preparing the reserves report with D&M is a Registered Professional Engineer in the State of Texas and a Senior Vice President of the firm. He received a Bachelor of Science degree in petroleum engineering from the University of Texas in 1984, has over 35 years of experience in the energy industry and is a member of the Society of Petroleum Engineers and the Society of Petroleum Evaluation Engineers. We provide our engineering firm with property interests, production, current operating costs, current production prices and other information. This information is reviewed by our Senior Vice President of Engineering and Business Development and outside consultant to ensure accuracy and completeness of the data prior to submission to our independent engineering firm. The scope and results of our independent engineering firm's procedures, as well as their professional qualifications, are summarized in the letter included as exhibit 99.1 to this Annual Report on Form 10-K.
Our proved undeveloped reserves were 2,082 MBOE at June 30, 2018, with associated future development costs of approximately $12.8 million. Our proved undeveloped reserves are comprised of (a) 1,545 MBOE of reserves and $10.9 million of future development costs associated with the Phase V development in the eastern portion of the field and (b) 537 MBOE of reserves and $1.9 million of future development costs associated with a proposed twelve-well infill drilling program to increase production and recover reserves which are not believed to be effectively producible with the existing well configuration. The infill project has aspects of both acceleration of production and an increase in ultimate reserves recovery and is being treated as a proved undeveloped project. NGL reserves were revised downward 69 MBOE reflecting lower than originally expected plant production partially offset by 43 MBOE of oil reserves due to better performance. During fiscal 2018 we spent $2.8 million on development of the twelve-well infill project, which during the year had been expanded from its original eight-well program, and $1.1 million on infrastructure for Test Site 5, or Phase V, primarily for water facilities and water curtain wells and related infrastructure. The twelve-well infill program consists of eight producer wells and four CO2 injection wells. Three producer wells and one CO2 injection well went online at the end of our fourth quarter, and the remaining five producer wells and three CO2 injection wells are expected to be completed and brought online by the end of October 2018.
proved reserves. Developed reserves are approximately 78% of total proved reserves as of June 30, 2018. However, as a result of the adverse fluid release event in the field in June 2013 and the resulting delay in reversion of our working interest, development of the field has not proceeded as originally scheduled. Expansion of the CO2 flood to the remaining undeveloped eastern portion of the field commenced subsequent to reversion of our working interest in late calendar 2014. We incurred $3.8 million of capital expenditures before the operator electively deferred this project as a result of a reduction in its cash flows and capital spending from the significant drop in oil prices. This project was further electively deferred as we began work on the NGL recovery plant in the Delhi field in February 2015. It was determined that the economics of development of the remaining eastern portion of the field would be significantly improved after the NGL plant was completed. During the year ended June 30, 2015, we authorized the NGL plant project and from late in that fiscal year until January 2017 when production of NGL began, we incurred $26.0 million of related capital expenditures. The NGL plant was completed in December 2016 and we converted approximately 1,377 MBOE of proved undeveloped reserves to proved developed reserves during the year ended June 30, 2017. As of June 30, 2018, we had estimated future net capital expenditures of $10.9 million remaining for development of the eastern part of the field. This work was suspended in late 2014 and further deferred until the NGL recovery plant was complete. We believe this project is economic in the current oil price environment and we expect it to be completed within the next two fiscal years. This would be nine years after the initial recording of proved reserves. During this period, we have been continuously developing the Delhi field and have spent over $35 million subsequent to reversion of our working interest in November 2014. Within the first half of fiscal 2019, we will incur an additional $1.9 million to complete the infill project and an additional $1.7 million of infrastructure for Test Site 5 as described above. Given the long-term nature of CO2 EOR development projects, we believe that the remaining undeveloped reserves in the Delhi field satisfy the conditions to continue to be treated as proved undeveloped reserves because (1) we initially established the development plan for the Delhi field in 2010 and continue to follow that plan, as adjusted to incorporate the completion of the NGL plant in late 2016 and delays relating to the 2013 fluid release event; (2) we have had significant ongoing development activities at this project that, as budgeted and currently being expended, reflect a significant and sufficient portion of remaining capital expenditures to convert proved undeveloped reserves to proved developed reserves; and (3) the operator has a historical record of completing the development of comparable long-term projects. As of June 30, 2018, no proved, probable or possible reserves were attributed to (a) the suspended southwestern tip area of the field, (b) the area beneath the inhabited portion of the Town of Delhi in the northeast and (c) the farthest east of the two remaining undeveloped sites in the eastern portion of field (Phase VI) due to the current economics and other technical aspects of our future development plans. In addition, no probable reserves are currently attributed to three smaller reservoirs within the Unit in similar formations with similar production history due to the lower oil price utilized in our reserves calculation. We also do not have proved or probable reserves associated with the Mengel Sand, a separate interval within the Unit that is not currently producing, which was received in the litigation settlement in June 2016. * BOE computed on units of production using a six to one conversion ratio of MCF's to barrels. Our productive drilling activity during the past three fiscal years ended June 30, 2018, was limited to five (1.2 net) producer wells completed in fiscal 2018. We completed one (.239 net) CO2 injection well during fiscal 2018 and had no completions in the previous two fiscal years. In connection with establishing a water curtain in advance of Phase V site development, we completed one (.239 net) well in fiscal 2018 and one (.239 net) well in fiscal 2017, the initial well of the program. No dry wells were drilled in the past three fiscal years. As of June 30, 2018, the Company had commenced drilling of one (.239 net) producer well, two (.48 net) CO2 injection wells and two (.48 net) wells in the water curtain program. Additional on-going development activities also include related flowlines and other infrastructure. For further discussion, see "Highlights for our fiscal year 2018" and "Capital Budget" under Item 7. Management's Discussion and Analysis of Financial Condition and Results of Operations of this Form 10-K.
As of June 30, 2018, we were neither committed to provide a fixed and determinable quantity of oil, NGLs or gas under existing agreements, nor do we currently intend to enter into any such agreements. The following table sets forth the number of productive oil and gas wells in which we owned a working interest as of June 30, 2018. The following table sets forth certain information regarding our developed and undeveloped lease acreage as of June 30, 2018. Developed acreage refers to acreage on which wells have been drilled or completed to a point that would permit production of oil and gas in commercial quantities. Undeveloped acreage refers to acreage on which wells have not been drilled or completed to a point that would permit production of oil and gas in commercial quantities whether or not the acreage contains proved reserves. When the Company acquired the Delhi field in 2003, the field had been fully developed through primary and secondary recovery and all of such acreage was reflected as developed acreage. With the addition of a CO2-EOR project in the field, certain acreage is now reflected as undeveloped using tertiary recovery operations. We estimate that our developed acreage currently includes 9,126 gross (2,180 net) acres in the Delhi field, with approximately 4,510 gross (1,077 net) acres attributable to the remaining undeveloped areas in the eastern part of the field. We own a 23.9% working interest in the field, along with certain mineral and royalty interests. We are not the operator of the EOR project. Our interests include all depths from the surface of the earth to the top of the Massive Anhydride, including the Delhi Holt Bryant Unit, which is currently under CO2 flood, and the Mengel Sand Interval, which is within the boundary of the field, but is currently not producing. As the Delhi field is unitized, all acreage, including any undeveloped, nonproductive or undrilled acreage is held by existing production as long as continuous production is maintained in the unit. * This table excludes acreage attributable to small overriding royalty interests retained in various formations in the Giddings Field area. None of such acreage is currently producing and our interests are subject to expiration if leases are not maintained by others or commercial production is not established. It does not currently appear likely that we will obtain any significant value from these interests. For more complete information regarding current year activities, including crude oil and natural gas production, refer to Item 7. Management's Discussion and Analysis of Financial Condition and Results of Operations of this Form 10-K.
See Note 16 – Commitments and Contingencies under Item 8. Financial Statements for a description of legal proceedings, which is incorporated herein by reference. Our common stock is currently traded on the NYSE American under the ticker symbol "EPM". The following table shows, for each quarter of the fiscal years ended June 30, 2018 and 2017, the high and low sales prices for EPM as reported by the NYSE American. As of June 30, 2018, there were 33,080,543 shares of common stock issued and outstanding, held by approximately 250 holders of record. We estimate there are approximately 2,000 individuals and institutions that hold our stock through nominees. We began paying cash quarterly dividends on our common stock in December 2013, at a rate of $0.10 per share and adjusted the rate to $0.05 per share in March 2015. Subsequently, we made a series of dividend rate increases effective in their respective initial months of payment: $ 0.065 per share in December 2016, $0.07 per share in March 2017, $0.075 per share in September 2017, and $0.10 per share in March 2018. As of June 30, 2018, we had paid twenty consecutive quarterly dividends on our common stock. In August 2018, the Company declared a $0.10 per share dividend payable on September 28, 2018. All dividends on our Series "A" Perpetual Preferred stock were timely declared and paid monthly prior to the November 2016 redemption of such preferred stock. Any future determination with regard to the payment of dividends will be at the discretion of the Board of Directors and will be dependent upon our future earnings, financial condition, applicable dividend restrictions and capital requirements and other factors deemed relevant by the Board of Directors. Under our current revolving credit facility, our ability to continue to pay common stock dividends is dependent on compliance with certain financial covenants related to debt service coverage, as defined in the agreement. 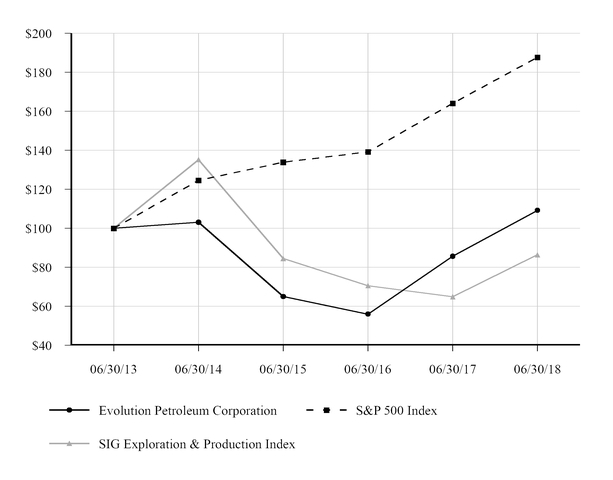 The following graph presents a comparison of the yearly percentage change in the cumulative total return on our Common Stock over the period from June 30, 2013 to June 30, 2018 with the cumulative total return of the S&P 500 Index and the S&P Oil & Gas Exploration and Production Index of publicly traded companies over the same period. The graph assumes that $100 was invested on June 30, 2013 in our common stock at the closing market price at the beginning of this period and in each of the other two indices and the reinvestment of all dividends, if any. The graph is presented in accordance with requirements of the SEC. Shareholders are cautioned against drawing any conclusions from the data contained therein, as past results are not necessarily indicative of future financial performance. As of June 30, 2018, all stock options had been exercised and no shares of common stock were issuable related to outstanding stock options. The Amended and Restated 2004 Stock Plan (the "Plan") provided for the issuance of a total of 6,500,000 common shares. Under the Plan as of June 30, 2018, 3,939,365 common shares had been issued upon the exercise of stock options, 2,382,843 shares of restricted common stock had been issued (of which 89,545 were unvested as of June 30, 2018), contingent restricted stock grants of 145,646 shares had been reserved (of which 28,562 were unvested as of June 30, 2018) and 32,146 remaining reserved shares were released in December 2016 to the Company's authorized but unissued and unreserved shares. The Plan was terminated upon the adoption of 2016 Equity Incentive Plan (the "2016 Plan"), which authorized the issuance of 1,100,000 shares of common stock. During fiscal 2018, 136,907 awards were made under the 2016 Plan and 963,093 shares of common stock remain available for future grants at June 30, 2018. During the fourth quarter ended June 30, 2018, the Company received shares of common stock from certain of its employees which were surrendered in exchange for their payroll tax liabilities arising from vestings of restricted stock and contingent restricted stock. The acquisition cost per share reflects the weighted-average market price of the Company's shares on the dates vested. (1)On May 12, 2015, the Board of Directors approved a share repurchase program covering up to $5 million of the Company's common stock. Under the program's terms, shares may be repurchased only on the open market and in accordance with the requirements of the Securities and Exchange Commission. The timing and amount of repurchases will depend upon several factors, including financial resources and market and business conditions. There is no fixed termination date for this repurchase program, and the repurchase program may be suspended or discontinued at any time. Such shares are initially recorded as treasury stock, then subsequently canceled. The Company has not repurchased any shares under this program since December 2015. The selected consolidated financial data, set forth below should be read in conjunction with Item 7. "Management's Discussion and Analysis of Financial Condition and Results of Operations" and with the consolidated financial statements and notes to those consolidated financial statements included elsewhere in this report. The following discussion and analysis should be read in conjunction with our Consolidated Financial Statements and Notes thereto included in Item 8, Financial Statements and Supplementary Data. Our discussion and analysis includes forward-looking information that involves risks and uncertainties and should be read in conjunction with Risk Factors under Item 1A of this Form 10-K, together with the statement of Forward-Looking Information at the beginning of this report for discussion of the risks and uncertainties that could cause our actual results to be materially different from our forward-looking statements. Certain dollar amounts and percentages in this Management’s Discussion and Analysis of Financial Condition and Results of Operations and other parts of this Annual Report on Form 10-K have been rounded for presentation, and certain amounts may not sum due to rounding. By policy, every employee and director maintains a beneficial ownership position in our common stock. We believe this ownership helps ensure that the interests of our employees and directors are aligned with our shareholders. As a result of the retirement of Randy Keys, President and Chief Executive Officer on May 31, 2018, the Board of Directors immediately moved to name Robert Herlin to act as Interim Chief Executive Officer and to commence a search for a permanent Chief Executive Officer. Additionally, the Board of Directors created a temporary Transition Services Committee, consisting solely of Director William Dozier, to aid and assist management in primarily evaluating potential property acquisitions and operational matters. Both of these appointments are deemed temporary while the ongoing search for a permanent Chief Executive Officer is resolved. We expect to fund our fiscal 2019 capital program from working capital and net cash flows from our properties. Our fiscal year 2018 net income was $19.6 million, or $0.59 per share, our seventh consecutive year of reporting net income. We funded all operations, including $5.4 million of capital spending, from internal resources and remained debt free. All of our capital expenditures and dividends were funded solely by cash flow from operations and working capital and we ended our fiscal year with no funded debt. We returned $11.6 million to common shareholders in the form of cash dividends during fiscal 2018. The annual dividend rate of $0.40 per share is an increase of 43% from a year ago. We remain committed to our dividend policy and rewarding our long-term shareholders. We extended the maturity date of our senior secured bank credit facility to April 2021. Our elected borrowing base is $40 million, and there are no outstanding borrowings as of September 1, 2018. Oil and NGL revenues increased by $6.8 million, or 20%, in fiscal 2018, principally driven by 23% higher realized commodity prices, offset in part by a 3% decrease in production volumes. Production was adversely impacted by factors including unusually cold weather and temporary reductions in CO2 injections to support our infill drilling program. The Delhi twelve-well infill drilling program is largely completed and only a few completions remain outstanding as of September 1, 2018. We expect the remainder of the project to be completed by October 2018, and we expect to see an uplift in oil volumes in fiscal 2019. $44.88 to $55.39 per BOE. Proved reserves are 86% oil and 14% natural gas liquids, and 78% of these reserves are developed and producing. Delhi probable reserves at June 30, 2018 were 4.5 MMBOE, a 15% decrease over the previous year. 80% of these reserves are classified as developed and producing as such are incremental reserves associated with existing developed and producing locations. Delhi possible reserves at June 30, 2018 were 4.6 MMBOE, a 42% increase over the previous year. 88% of these reserves are classified as developed and producing as such are incremental reserves associated with existing developed and producing locations. PV-10 of Proved reserves is a pre-tax non-GAAP measure. We have included a reconciliation of PV-10 to the unaudited after-tax Standardized Measure of Discounted Future Net Cash Flows ("Standardized Measure"), which is the most directly comparable financial measure calculated in accordance with GAAP, in Item 2. "Properties." We believe that the presentation of the non-GAAP financial measure of PV-10 provides useful and relevant information to investors because of its wide use by analysts and investors in evaluating oil and gas companies, and that it is relevant and useful in evaluating the relative monetary significance of oil and natural gas properties. Further, analysts and investors may utilize the measure as a basis for comparison of the relative size and value of our reserves to other companies’ reserves. We also use this pre-tax measure when assessing the potential return on investment related to oil and natural gas properties and in evaluating acquisition opportunities. Because there are many unique factors that can impact an individual company when estimating the amount of future income taxes to be paid, we believe the use of a pre-tax measure is valuable for evaluating our Company. PV-10 is not a measure of financial or operating performance under GAAP, nor is it intended to represent the current market value of our estimated oil and natural gas reserves. PV-10 should not be considered in isolation or as a substitute for the Standardized Measure as defined under GAAP, and is reconciled to the Standardized Measure in Item 2. Properties. Probable and possible reserves are not recognized as GAAP, nor is there a comparable GAAP measure. Additional property and project information is included under Item 1. Business, Item 2. Properties, Item 8. Financial Statements - Notes to the Financial Statements and Exhibit 99.4 of this Form 10-K.
Our interests in the Delhi field consist of a 23.9% working interest (with associated 19.0% net revenue interest) and separate overriding royalty and mineral interests of 7.2%. This yields a total net revenue interest of 26.2%. The Delhi field is operated by Denbury Onshore, LLC, and subsidiary 100% owned by Denbury Resources, Inc. (the "operator"). Proved reserves volumes totaled 9.4 MMBOE with a Standardized Measure of $119 million and a PV-10* value of $146 million compared to the prior year's 10.1 MMBOE with a Standardized Measure of $83 million and a PV-10* value of $111 million. Transfers from probable oil reserves led to a 0.4 MMBO (4%) positive revision in proved oil reserves. Performance from the NGL plant was below our expectations, resulting in a 0.3 MMBO (19%) negative revision to NGL reserves. Combined, these revisions had a slight positive effect on equivalent reserves volumes. However, with NGL prices 67% the level of oil prices, the overall impact on value was more positive. Probable reserve volumes at Delhi were 4.5 MMBOE, a decrease of 15% compared to 5.3 MMBOE in the prior year. Possible reserves volumes at Delhi were 4.6 MMBOE, an increase of 42% compared to 3.2 MMBOE in the prior year. fiscal quarter’s 6,427 BOPD. NGL production in the fourth quarter was 1,015 BOEPD, 34% higher than prior quarter production of 760 BOEPD. Production during the quarter was impacted by reduced volumes of CO2 injected into the field due primarily to warmer temperatures, compressor downtime for repairs and reduced CO2 injections near wells being drilled as part of the infill drilling program. July production is also expected to be similarly impacted. Production only included a small volume from the first three wells of the twelve infill well drilling program initiated in March 2018; the wells are expected to gradually begin materially impacting production over the next two to three quarters. The twelve-well infill program consists of eight producer wells and four CO2 injection wells. Three producer wells and one CO2 injection well went online at the end of the fourth quarter, and the remaining five producers and three CO2 injection wells are expected to be completed and brought online by the end of October 2018. The infill program targets productive oil zones in the developed area of the field that the operator believes are not being swept effectively by the current CO2 flood. This program is expected to both add production and increase ultimate recoveries above the current proved producing oil reserves. The average oil price realized by Evolution during the fourth quarter of fiscal 2018 was $67.41 compared to $63.56 during the previous quarter. The average NGL price realized by Evolution during the fourth quarter of fiscal 2018 was $38.39 per barrel compared to $34.05 during the previous quarter. Evolution continues to benefit from the premium that Delhi field oil receives selling under Louisiana Light Sweet ("LLS") pricing, as compared to the more widely known West Texas Intermediate ("WTI") price, and the oil is shipped to market directly by pipeline, the most efficient means of transportation from the field. Our overall lifting costs for the year were $16.36 per BOE increased 16% from $14.10 per BOE in the prior year. Our cost of purchased CO2 in the Delhi field, the largest single component of operating costs, is directly tied to the price of oil sold from the field. This major operating cost increased 5.6% due to the higher price of crude, partially offset by lower purchased volumes. Gross CO2 injection rates for the year ended June 30, 2018 averaged 65.0 MMcf per day, a decline of 11% compared to the 73.1 MMcf per day during fiscal 2017. Other lease operating expenses for the fiscal 2018 increased 17.4% compared to the prior year , primarily due to workover expenses and the cost of the NGL plant, which commenced operations in December 2016, midway through our fiscal year 2017. For fiscal 2018, our gross NGL production was 976 BOEPD, which sold at an average price of $33.50 per barrel compared to prior year gross production of 459 BOEPD for which we realized $21.28 per barrel. Production from the NGL plant is transported by truck to a processing plant in East Texas, and therefore bears a material transportation charge. Plant efficiencies have improved from the prior year and the higher realized price reflects both the impact of higher oil prices and improvements in meeting the purchaser's specification requirements. Under the operator's marketing contract, we receive market index pricing for each NGL component, based on the processed yield, less transportation, processing fees and other deductions. Our current mix of products contains a large percentage (~70%) of higher value NGL's, such as pentanes and butane, and almost no lower value ethane. Market pricing for our NGL's during the fourth quarter was favorable, with net realized NGL prices averaging approximately 57% of WTI prices (net realized price is after deduction of transportation and fractionation charges). NGL demand often has a seasonal pattern and prices tend to be higher during the cooler months of October through March. Accordingly, the relationship between NGL prices and WTI has fluctuated over time and we expect such volatility to continue. The NGL plant includes an electric turbine to convert methane and part of the ethane processed by the plant to electricity. This turbine is generating power for the NGL plant and supplies excess power to the CO2 recycle facility, contributing to an 11% decline in electricity expense year over year. The NGL plant is accomplishing its primary objective of removing the lighter hydrocarbons (i.e. methane and ethane), thereby increasing the purity of the CO2 recycle stream and improving the efficiency of the flood. Over time, it is expected to increase the recovery of crude oil in the field. The plant is also providing feedstock to power the electric turbine and producing significant quantities of higher value NGL's for sale. Remaining estimated capital expenditures for our proved undeveloped reserves amount to approximately $6.15 per BOE for the remainder of the infill drilling project and Phase V. No remaining capital expenditures are required to develop our probable or possible reserves as these reserves reflect incremental quantities associated with a greater percentage recovery of hydrocarbons in place than the recovery quantities assumed for proved reserves. Looking forward, the timing of plans for continued development of the eastern part of the Delhi field is dependent on the operator’s plans for capital allocation within their portfolio. Development of unquantified volumes is dependent upon the timing of excess capacity within the processing plant and oil price. We continue to believe that this high quality and economically viable project will be executed as planned, subject to oil price volatility. Tax Act became effective upon passage, so our statutory rate for the current fiscal year ended June 30, 2018 is a blended rate of 27.55%. The permanent reduction in the federal corporate income tax rate resulted in a one-time non-cash income tax benefit of approximately $6.1 million related to the adjustment of our liability for deferred income taxes to the lower rate in the Tax Act. This benefit was recognized in the quarter ended December 31, 2017. The accounting for the effects of the rate change on the Company’s deferred tax balances was complete as of December 31, 2017 and no provisional amounts were recorded. (a) The income tax provision for the ended June 30, 2018 includes a one-time non-cash benefit of approximately $6.1 million for the adjustment of our liability for deferred income taxes to the lower rate in the Tax Act. This discrete adjustment results in a negative tax rate (benefit) for this period. (b) Income taxes are recorded in our financial statements based on our estimated annual effective income tax rate together with any discrete items. For the year ended June 30, 2018, the effective rate used in the calculation of our income tax expense was approximately 16%. Applying this rate together with the $6.1 million discrete revaluation benefit resulted in the negative tax rate (benefit) of (21)%. Compared to the year ended June 30, 2017, the effective tax rate for the year ended June 30, 2018, excluding the impact of the $6.1 million deferred tax adjustment, was lower than the prior year tax rate due principally to increased depletion in excess of basis. We had $27.7 million and $23.4 million of working capital at June 30, 2018 and June 30, 2017, respectively. In addition, we have a senior secured reserve-based credit facility (the "Facility") with a maximum borrowing capacity of $50.0 million. The Facility had $40.0 million of undrawn borrowing base availability on June 30, 2018. There have been no borrowings under the Facility, which is secured by substantially all of the Company’s assets. In February 2018, we elected to increase the borrowing base from $10.0 million to $40.0 million. Additionally, on May 28, 2018, we entered into the third amendment to our credit agreement governing the revolving credit facility to, among other things, extend the maturity date to April 11, 2021 and amend certain financial covenants. The borrowing base is subject to periodic redeterminations and further adjustments from time to time. The borrowing base will be redetermined semi-annually on May 15 and November 15 of each year. The borrowing base will also be reduced in certain circumstances such as the sale or disposition of certain oil and gas properties of the Company or its subsidiaries and changes to certain hedging positions. With volatility in commodity prices, our borrowing base and related commitments under the Facility could be reduced in the future. Any future borrowings bear interest, at the Company's option, at either LIBOR plus 2.75% or the Prime Rate, as defined in the Facility agreement, plus 1.0%. The Facility contains covenants that require the maintenance of (i) a total leverage ratio of not more than 3.0 to 1.0, (ii) a debt service coverage ratio of not less than 1.1 to 1.0 and (iii) a consolidated tangible net worth of not less than $50.0 million, each as defined in the Facility agreement. As of June 30, 2018, the Company was in compliance with all covenants under the Facility, and no amounts were outstanding under the Facility. During our fiscal year ended June 30, 2018, we funded our operations and cash dividends with cash generated from operations; our cash balance and working capital increased $1.9 million and $4.3 million, respectively, from June 30, 2017. We have historically funded our operations through cash from operations and working capital. Our primary source of cash is the sale of oil and natural gas liquids production. A portion of these cash flows are used to fund our capital expenditures. While we expect to continue to expend capital to further develop the Delhi field, we and the operator have flexibility as to when this capital is spent. The Company expects to manage future development activities in the Delhi field within the boundaries of its operating cash flow and existing working capital. resources of cash, working capital and borrowing capacity under our credit facility. It may also be advantageous for us to consider issuing additional equity as part of any potential transaction, but we have no specific plans to do so at this time. Our other significant use of cash is our on-going dividend program. The Board of Directors instituted a cash dividend on our common stock in December 2013 and we have since paid twentieth consecutive quarterly dividends. Distribution of free cash flow in excess of our operating and capital requirements through cash dividends and potential repurchases of our common stock remains a priority of our financial strategy, and it is our long term goal to increase our dividends over time as appropriate. In February 2018, the Board declared an increase in the quarterly common stock dividend from $0.075 per share to $0.10 per share, effective with the dividend payment in March 2018. In August 2018, the Board declared a $0.10 per share dividend payable on September 28, 2018. The amount of future dividends paid to Evolution Petroleum common stockholders is determined by the Board on a quarterly basis and is based on the Company’s earnings, financial condition, capital requirements, the effect a dividend payment would have on the Company’s compliance with relevant financial covenants, and other factors deemed relevant by the Board. For the year ended June 30, 2018, cash flows provided by operating activities were $20.5 million, reflecting $21.9 million provided by operations before $1.4 million used by other working capital changes. Of the $21.9 million provided before working capital changes, approximately $19.6 million resulted from net income and $2.3 million was attributable to non-cash expenses and gains. For the year ended June 30, 2017, cash flows provided by operating activities were $16.5 million, reflecting $19.0 million provided by operations before $2.5 million used by other working capital changes. Of the $19.0 million provided before working capital changes, approximately $8.0 million resulted from net income and $10.9 million was attributable to non-cash expenses and gains. For the year ended June 30, 2016, cash flows provided by operating activities were $30.7 million, reflecting $28.9 million provided by operations before $1.8 million provided by other working capital changes. Of the $28.9 million provided before working capital changes, approximately $24.7 million resulted from net income and $4.2 million was attributable to non-cash expenses and gains. For the year ended June 30, 2018, investing activities used $3.7 million of cash, consisting primarily of capital expenditures of approximately $3.7 million for the Delhi field. For the year ended June 30, 2017, investing activities used $10.5 million of cash, consisting primarily of cash capital expenditures of approximately $10.2 million for the Delhi field, partially offset by $0.3 million of derivative settlements paid. For the year ended June 30, 2016, investing activities used $17.6 million of cash, consisting primarily of cash capital expenditures of approximately $21.1 million for the Delhi field, partially offset by $3.6 million of derivative settlement payments received. Oil and gas capital expenditures incurred, which includes accrued expenditures and other noncash items, were $5.4 million, $7.6 million, and $19.7 million, respectively, for the years ended June 30, 2018, 2017, and 2016. These amounts can be reconciled to cash capital expenditures on their respective cash flow statements by adjusting them for related non-cash items presented at Note 12 – Supplemental Cash Flow Information. For the year ended June 30, 2018, financing activities used $12.2 million of cash, comprised of $11.6 million of common stock cash dividends, and $0.6 million of treasury stock acquired through the surrender of shares in satisfaction of payroll liabilities related to vestings of stock-based compensation awards. For the year ended June 30, 2017, financing activities used $17.1 million of cash, comprised of $8.4 million of common stock cash dividends, $0.3 million of preferred dividends, $7.9 million for redemption of preferred stock in November 2016 and $0.5 million of treasury stock acquired through the surrender of shares in satisfaction of payroll liabilities related to vestings of stock-based compensation awards. For the year ended June 30, 2016, financing activities provided $0.9 million of cash from $9.6 million of tax benefits related to stock-based compensation partially offset by $7.2 million of dividend payments to common and preferred shareholders and $1.4 million of treasury stock acquisitions, primarily attributable to the Company's share buyback program. The tax benefits included a $1.5 million cash refund received from the State of Louisiana for carryback of stock-based compensation deductions to previously filed returns. During the year ended June 30, 2018, we incurred $5.4 million of capital expenditures at Delhi. This spending included $0.4 million for capital upgrades to the recycle plant, $1.1 million for CO2 conformance projects and capital maintenance, $1.1 million for Test Site 5 infrastructure (i.e. water curtain wells) in the eastern portion of the field, and $2.8 million for the infill drilling program. The twelve-well infill drilling program in the Delhi field commenced March 2018 and all twelve wells are expected to be drilled and completed by the end of September and on budget. The total project had an estimated net cost of $4.7 million, with approximately sixty percent of those costs incurred in fiscal year 2018, with the balance to be incurred in fiscal first quarter of 2019. All twelve wells are expected to be in operation by the end of October 2018 and the operator anticipates an uplift in oil volumes to be reported over the next few quarters. The program consists of four new CO2 injection wells and eight new production wells and targeted productive oil zones which we believe were not being swept effectively by the current CO2 flood, thereby adding incremental production. We previously approved additional net capital expenditures totaling $2.8 million for water injection, flowlines and other infrastructure projects in preparation for the Test Site 5 development. Such development requires participation by both the operator and Evolution, and the operator has not yet finalized its capital expenditure budget for 2019. Approximately $1.1 million of these preparation costs have been incurred as of June 30, 2018. In addition, we expect to continue to perform conformance workover projects and will likely incur additional maintenance capital expenditures. Such amounts cannot be estimated accurately at this time, but are not expected to be material to our financial position. Funding for our anticipated capital expenditures at Delhi over the next two fiscal years is expected to be met from cash flows from operations and current working capital. Our current liquidity position remains strong, with $27.7 million of working capital, which is significantly in excess of our expected capital needs at Delhi. We also expect positive cash flow in the future. Our future liquidity is dependent on the realized prices we receive for the oil and natural gas liquids we produce. Commodity prices are market driven and historically volatile, and they are likely to continue to be volatile. The Company may utilize derivative instruments to reduce its exposure to short term oil price volatility with the goal of achieving a more predictable level of cash flows to support the Company’s capital expenditure and dividend programs. From time to time, the Company has used both fixed price swap agreements and costless collars to manage its exposure to crude oil price risk. We have no derivative commitments at June 30, 2018. While the use of derivative instruments limits the downside risk of adverse price movements, they may also limit future revenues from favorable price movements. Our future revenues, cash flow, profitability, access to capital and future rate of growth will be significantly impacted by the prices we receive for our production. Funding for our anticipated capital expenditures over the next two fiscal years is expected to be met from cash flows from operations and current working capital. Our preference is to remain debt free under our current operating plans, but we have access to at least $40 million of availability under a senior secured credit facility if required. In addition, we have a maximum of $500 million authorized under an effective shelf registration statement with Securities and Exchange Commission under which we may sell new securities from time to time in one or more offerings. We may choose to evaluate and pursue new growth opportunities through acquisitions or other transactions. In that event, we would expect to use our internal resources of cash, working capital and borrowing capacity under our credit facility. It may also be advantageous for us to consider issuing additional equity as part of any potential transaction, but we have no specific plans to do so at this time. The Board of Directors instituted a cash dividend on our common stock in December 2013 and have since paid twenty consecutive quarterly dividends and have declared the twenty-first dividend for payment on September 28, 2018. The amount of future dividends paid to Evolution common stockholders is determined by the Board on a quarterly basis and is based on the Company’s earnings, financial condition, capital requirements, the effect a dividend payment would have on the Company’s compliance with relevant financial covenants, and other factors deemed relevant by the Board. In May 2015, we established a stock repurchase plan to allow us to acquire up to $5.0 million of our common stock over time. We have repurchased $1.6 million of common stock under the plan, but made no stock repurchases during fiscal 2017 or fiscal 2018. The timing and amount of repurchases will depend upon several factors, including financial resources and market conditions. In general, our share repurchase program is limited to discretionary funds and is of lesser importance than our primary objectives related to our development capital spending at Delhi and our common stock dividend program. There is no fixed termination date for the repurchase program, and the repurchase program may be suspended or discontinued at any time. (a) Includes ad valorem and production taxes of $188,058, $214,553, and $294,689 for the years ended June 30, 2018, 2017, and 2016, respectively. (b) Excludes depreciation and amortization expense of artificial lift technology services below and excludes non-operating asset depreciation of $31,691, $31,502, and $20,522 for the years ended June 30, 2018, 2017, and 2016, respectively. Net Income Attributable to Common Shareholders. For the year ended June 30, 2018, we generated net income of $19.6 million, or $0.59 per diluted share, on total revenues of $41.3 million. This compares to net income of $6.8 million, or $0.21 per diluted share, on total revenues of $34.5 million for the corresponding year-ago period. The $12.8 million earnings increase reflects $6.8 million of higher revenue, a $8.3 million income tax decrease attributable to the 2017 Tax Cuts and Jobs Act and a $1.2 million decrease in earnings allocated to preferred stock because of its redemption, partially offset by $3.5 million of higher operating expenses, primarily production costs and general and administrative expense. Oil and Gas Production. Revenues increased 20% to $41.3 million primarily due to a 23% increase in realized prices from $44.88 per equivalent barrel to $55.39 per equivalent barrel on lower (3.0)% in equivalent barrels. All of our revenues in the current fiscal year came from the Delhi field, as did all of our revenues from the prior year. Net Delhi oil production volumes of 1,786 BOPD at an average price of $58.52 decreased 199 BOPD from the prior year period primarily due to the abnormal sub-freezing temperatures that disrupted operations in January, plant scheduled maintenance later in our third quarter and reduced CO2 injections in the fourth quarter due to compressor maintenance and infill drilling activities. Net NGL production averaged 256 BOEPD, at an average price of $33.50 per barrel, an increase of 136 BOEPD compared to the year-ago period as NGL plant production began in January 2017, representing only a partial year of production. Production Costs. Production costs for the year ended June 30, 2018 were $12.2 million, a 13% increase from the prior year primarily due to higher CO2 costs and the incremental operating costs of the NGL plant that commenced operations in January 2017. CO2 costs increased $0.3 million, or 6%, due to higher purchased CO2 costs per Mcf, which correlates to the 26% increase in realized oil price from the prior year, partially offset by a 11.0% decrease in purchase volumes. Average gross purchased CO2 volumes decreased from 73.1 MMcf per day in the year-ago period to 65.0 MMcf per day for the current year. Other production costs, which include incremental costs of the NGL plant, power, chemicals, workovers, repairs and maintenance, labor and overhead, increased $1.1 million, or 17%, from the year-ago period. Approximately $0.9 million of this increase were due to higher NGL plant-related expenses. Total production costs per equivalent barrel in the current period were $16.36 per BOE on total production volumes, compared to $14.10 in the prior year period. General and Administrative Expenses (“G&A”). G&A expenses increased $1.8 million, or 36%, from the prior year, to $6.8 million for the year ended June 30, 2018. The expense increase reflected increases of $0.4 million of litigation and non-recurring settlement expenses, $0.2 million of non-cash stock-based compensation expense, $0.2 million of severance, $0.2 million of board expenses, and $0.7 million of due diligence costs associated with property acquisitions evaluations. In early fiscal 2019, we received a $1.1 million break-up fee related to our Enduro stalking horse bid thereby recovering $0.4 million of acquisition expenses incurred in fiscal 2018. See Note 3 – Enduro Purchase and Sale Agreement and Related Subsequent Events. Depreciation, Depletion & Amortization Expense (“DD&A”). DD&A increased $0.3 million, or 5%, to $6 million for the year ended June 30, 2018 compared to the prior year, primarily due to increased full cost amortization from a higher amortization rate of $8.02 per BOE compared to $7.40 per BOE in the year ago period, partially offset by the 3.0% decrease in production volumes. The higher rate was principally due to increased development costs at Delhi field. Net Income Attributable to Common Shareholders. For the year ended June 30, 2017, we generated net income of $6.8 million, or $0.21 per diluted share, on total revenues of $34.5 million. This compares to net income of $24.0 million, or $0.73 per diluted share, on total revenues of $26.1 million for the previous year. The $17.2 million earnings decrease principally resulted from a decrease of $32.6 million in other income, reflecting a $28.1 million previous year litigation settlement, a $3.4 million decrease in derivative instrument gains, and a $1.1 million prior year insurance settlement together with a $0.6 million increase in allocated net income to holders of called preferred shares, partially offset by $8.1 million of higher revenue, $3.1 million of decreased operating costs, and $4.7 million of lower income taxes. Oil and Gas Production. Revenues increased 31.9% to $34.5 million primarily as a result of a 16.6% increase in production volumes from the previous year together with a 13.1% increase in realized prices from $39.68 per equivalent barrel to $44.88 per barrel in Fiscal 2017. Delhi production and revenues comprise virtually all of our revenues. Net Delhi oil production of 1,985 BOPD was 10.4% higher compared to the Previous Year as a result of production enhancement and conformance operations in the field. In addition $0.9 million of initial plant NGL sales commenced at the beginning of our third fiscal quarter and averaged 120 BOEPD over the entire fiscal year. gross CO2 injection rate was 73.1 MMcf per day, compared to 73.8 MMcf per day in the Previous Year. For the Fiscal 2017 year, production costs were $14.10 per barrel on total production volumes, compared to $13.76 per BOE in the Previous Year. Calculated solely on our Delhi working interest volumes, production costs were $19.01 per barrel of which $8.03 per barrel was CO2 cost. These latter production costs per barrel exclude production volumes from our royalty interests in the Delhi field as they bear only certain allocated NGL production costs, and are therefore higher than the rates per barrel on our total production volumes. General and Administrative Expenses (“G&A”). G&A expenses decreased $4.1 million, or 45%, from the previous year, to $5.0 million for the year ended June 30, 2017, primarily due to a $2.6 million decrease in litigation costs, a $0.6 million decrease in stock-based compensation, $0.5 million of lower bonus expense, and $0.5 million of lower salary and benefit expenses. Other Income and Expenses. For the year ended June 30, 2017, aggregate other items decreased $32.6 million from the previous year due to the $28.1 million Delhi field litigation settlement in the previous year, a $3.4 million decrease in derivative gains and a $1.1 million insurance recovery in the previous year. Depreciation, Depletion & Amortization Expense (“DD&A”). DD&A increased $0.6 million, or 11%, to $5.7 million for the year ended June 30, 2017 compared to the previous year, due to an increase of $0.8 million in full cost pool depletion, partially offset by a $0.2 million decrease in fixed asset depreciation, which was impacted by the previous year impairment of artificial lift equipment. Compared to the previous year, the increase in full cost pool amortization reflects a 16.6% production increase to 0.8 million BOE, partially offset by a small 0.7% decrease in the amortization rate to $7.40 per BOE. Inflation. Although the general inflation rate in the United States, as measured by the Consumer Price Index and the Producer Price Index, has been relatively low in recent years, the oil and gas industry has experienced unusually volatile price movements in commodity prices, vendor goods and oilfield services. Prices for drilling and oilfield services, oilfield equipment, tubulars, labor, expertise and other services impact our lease operating expenses and our capital expenditures. During fiscal 2018 to date, we have seen a firming of prices for operating and capital costs as a result of improving demand and a closer balance with the supply of goods and services in the industry. Product prices, operating costs and development costs may not always move in tandem. Known Trends and Uncertainties. General worldwide economic conditions, as well as economic conditions for the oil and gas industry specifically, continue to be uncertain and volatile. Regional and worldwide market factors, such as tariffs or trade restrictions, may also increase production costs. Concerns over uncertain future economic growth are affecting numerous industries and companies, as well as consumers, which impact demand for crude oil and natural gas. If the supply of crude oil and natural gas exceeds demand in the future, it may put downward pressure on crude oil and natural gas prices, thereby lowering our revenues, profits, cash flow and working capital going forward. While we realized higher average oil prices in the current quarter than any period since the quarter ended December 31, 2014, there can be no assurance that such prices will continue to prevail or trend upward. Seasonality. Our business is generally not directly seasonal, except for instances when weather conditions may adversely affect access to our properties or delivery of our petroleum products. Although we do not generally modify our production for changes in market demand, we do occasionally experience seasonality in the product prices we receive, driven by summer cooling and driving, winter heating, and extremes in seasonal weather, including hurricanes. We have also experienced adverse impacts on our production from very high summer temperatures and extremely cold winter weather. The table below provides estimates of the timing of future payments that, as of June 30, 2018, we are obligated to make under our contractual obligations and commitments. We expect to fund these contractual obligations with cash on hand and cash generated from operations. The preparation of financial statements in accordance with accounting principles generally accepted in the United States of America requires that we select certain accounting policies and make estimates and assumptions that affect the reported amounts of the assets and liabilities and disclosures of contingent assets and liabilities as of the date of the balance sheet as well as the reported amounts of revenues and expenses during the reporting period. These policies, together with our estimates have a significant effect on our consolidated financial statements. Our significant accounting policies are included in Note 2 – Summary of Significant Accounting Policies of the consolidated financial statements. Following is a discussion of our most critical accounting estimates, judgments and uncertainties that are inherent in the preparation of our consolidated financial statements. Oil and Natural Gas Properties. Companies engaged in the production of oil and natural gas are required to follow accounting rules that are unique to the oil and gas industry. We apply the full cost accounting method for our oil and natural gas properties as prescribed by SEC Regulation S-X Rule 4-10. Under this method of accounting, the costs of unsuccessful, as well as successful, exploration and development activities are capitalized as properties and equipment. This includes any internal costs that are directly related to property acquisition, exploration and development activities but does not include any costs related to production, general corporate overhead or similar activities. Gain or loss on the sale or other disposition of oil and gas properties is not recognized, unless the gain or loss would significantly alter the relationship between capitalized costs and proved reserves. Oil and natural gas properties include costs that are excluded from costs being depleted or amortized. Oil and natural gas property costs excluded represent investments in unevaluated properties and include non-producing leasehold, geological and geophysical costs associated with leasehold or drilling interests and exploration drilling costs. We exclude these costs until the property has been evaluated. Costs are transferred to the full cost pool as the properties are evaluated. As of June 30, 2018, we had no unevaluated properties costs. Estimates of Proved Reserves. The estimated quantities of proved oil and natural gas reserves have a significant impact on the underlying financial statements. The estimated quantities of proved reserves are used to calculate depletion expense, and the estimated future net cash flows associated with those proved reserves is the basis in determining impairment under the quarterly ceiling test calculation. The process of estimating oil and natural gas reserves is very complex, requiring significant decisions in the evaluation of all available geological, geophysical, engineering and economic data. Estimated reserves are often subject to future revisions, which could be substantial, based on the availability of additional information, including reservoir performance, additional development activity, new geological and geophysical data, additional drilling, technological advancements, price changes and other economic factors. As a result, material revisions to existing reserve estimates may occur from time to time. Although every reasonable effort is made to ensure that the reported reserve estimates represent the most accurate assessments possible, including the hiring of independent engineers to prepare our reserve estimates, the subjective decisions and variances in available data for the properties make these estimates generally less precise than other estimates included in our financial statements. Material revisions to reserve estimates and/or significant changes in commodity prices could substantially affect our estimated future net cash flows of our proved reserves, affecting our quarterly ceiling test calculation and could significantly affect our depletion rate. A 10% decrease in commodity prices used to determine our proved reserves as of June 30, 2018 would not have resulted in an impairment of our oil and natural gas properties. Holding all other factors constant, a reduction in the Company's proved reserve estimates at June 30, 2018 of 5%, 10% and 15% would affect depreciation, depletion and amortization expense by approximately $306,000, $646,000 and $1,026,000, respectively. On December 31, 2008, the SEC issued its final rule on the modernization of reporting oil and gas reserves. The rule allows consideration of new technologies in evaluating reserves, generally limits the designation of proved reserves to those projects forecast to be commenced within five years of the end of the period, allows companies to disclose their probable and possible reserves to investors, requires reporting of oil and gas reserves using an average price based on the previous 12-month unweighted arithmetic average first-day-of-the-month price rather than year-end prices, revises the disclosure requirements for oil and gas operations, and revises accounting for the limitation on capitalized costs for full cost companies. Valuation of Deferred Tax Assets. We make certain estimates and judgments in determining our income tax expense for financial reporting purposes. These estimates and judgments occur in the calculation of certain tax assets and liabilities that arise from differences in the timing and recognition of revenue and expense for tax and financial reporting purposes. Our federal and state income tax returns are generally not prepared or filed before the consolidated financial statements are prepared or filed; therefore, we estimate the tax basis of our assets and liabilities at the end of each period as well as the effects of tax rate changes, tax credits, and net operating loss carry backs and carry forwards. Adjustments related to these estimates are recorded in our tax provision in the period in which we file our income tax returns. Further, we must assess the likelihood that we will be able to recover or utilize our deferred tax assets (primarily our net operating loss). If recovery is not likely, we must record a valuation allowance against such deferred tax assets for the amount we would not expect to recover, which would result in an increase to our income tax expense. As of June 30, 2018, we have recorded a valuation allowance for the portion of our net operating loss that is limited by IRS Section 382. Management considers the scheduled reversal of deferred tax liabilities, projected future taxable income, and tax planning strategies in making the assessment of the ultimate realization of deferred tax assets. Based upon the level of historical taxable income and projections for future taxable income over the periods for which the deferred tax assets are deductible, as of end of the current fiscal year, we believe that it is more likely than not that the Company will realize the benefits of its net deferred tax assets. If our estimates and judgments change regarding our ability to utilize our deferred tax assets, our tax provision would increase in the period it is determined that recovery is not probable. Stock-based Compensation. The fair value and expected vesting period of the Company's market-based awards were determined using a Monte Carlo simulation based on the historical volatility of our total common stock return compared to the historical volatilities of the other companies in the index. Vesting of market-based awards is based on the Company's total common stock return compared to a peer group of other companies in our industry with comparable market capitalizations. We estimate the fair value of stock option awards on the date of grant using the Black-Scholes option pricing model. This valuation method requires the input of certain assumptions, including expected stock price volatility, expected term of the award, the expected risk-free interest rate, and the expected dividend yield of the Company's stock. The risk-free interest rate used is the U.S. Treasury yield for bonds matching the expected term of the option on the date of grant. Because of our limited trading experience of our common stock and limited exercise history of our stock option awards, estimating the volatility and expected term is very subjective. We base our estimate of our expected future volatility on peer companies whose common stock has been trading longer than ours, along with our own limited trading history while operating as an oil and natural gas producer. Future estimates of our stock volatility could be substantially different from our current estimate, which could significantly affect the amount of expense we recognize for our stock-based compensation awards. Recent Accounting Pronouncements. See Note 2 – Summary of Significant Accounting Policies to our Consolidated Financial Statements for discussion of the recent accounting pronouncements issued by the Financial Accounting Standards Board. The Company has no off-balance sheet arrangements as of June 30, 2018. We are exposed to changes in interest rates. Changes in interest rates affect the interest earned on our cash and cash equivalents. Under our current policies, we do not use interest rate derivative instruments to manage exposure to interest rate changes. expenditures and our ability to borrow and raise additional capital, as, if and when needed. We use derivative instruments to manage our exposure to commodity price risk from time to time based on our assessment of such risk. We primarily utilize swaps and costless collars to reduce the effect of price changes on a portion of our future oil production. We do not enter into derivative instruments for trading purposes. The Company had no positions in derivative instruments at June 30, 2018. We have audited the accompanying consolidated balance sheet of Evolution Petroleum Corporation and Subsidiaries (the “Company”) as of June 30, 2018, the related consolidated statements of operations, cash flows and changes in stockholders’ equity for the year ended June 30, 2018, and the related notes (collectively referred to as the “consolidated financial statements”). In our opinion, the consolidated financial statements present fairly, in all material respects, the consolidated financial position of the Company as of June 30, 2018, and the consolidated results of its operations and its cash flows for the year ended June 30, 2018, in conformity with accounting principles generally accepted in the United States of America. We also have audited, in accordance with the standards of the Public Company Accounting Oversight Board (United States) (“PCAOB”), the Company’s internal control over financial reporting as of June 30, 2018, based on criteria established in Internal Control - Integrated Framework 2013 issued by the Committee of Sponsoring Organizations of the Treadway Commission and our report dated September 10, 2018 expressed an unqualified opinion on the Company’s internal control over financial reporting. We have audited the accompanying consolidated balance sheet of Evolution Petroleum Corporation and subsidiaries (the “Company”) as of June 30, 2017, and the related consolidated statements of operations, cash flows, and changes in stockholders' equity for each of the two years in the period ended June 30, 2017. These consolidated financial statements are the responsibility of the Company's management. Our responsibility is to express an opinion on these consolidated financial statements based on our audits. In our opinion, the consolidated financial statements referred to above present fairly, in all material respects, the consolidated financial position of Evolution Petroleum Corporation and subsidiaries as of June 30, 2017, and the results of their operations and their cash flows for each of the two years in the period ended June 30, 2017, in conformity with U.S. generally accepted accounting principles. We have audited Evolution Petroleum Corporation and Subsidiaries’ (the “Company”) internal control over financial reporting as of June 30, 2018, based on criteria established in Internal Control - Integrated Framework 2013 issued by the Committee of Sponsoring Organizations of the Treadway Commission (“COSO”). In our opinion, the Company maintained, in all material respects, effective control over financial reporting as of June 30, 2018, based on criteria established in Internal Control - Integrated Framework 2013 issued by COSO. expressed an unqualified opinion on those consolidated financial statements. The Company’s management is responsible for maintaining effective internal control over financial reporting and for its assessment of the effectiveness of internal control over financial reporting, included in the accompanying Management’s Report on Internal Control over Financial Reporting included in Item 9A. Our responsibility is to express an opinion on the Company’s internal control over financial reporting based on our audit. We are a public accounting firm registered with the PCAOB and are required to be independent with respect to the Company in accordance with the U.S. federal securities laws and the applicable rules and regulations of the Securities and Exchange Commission and the PCAOB. General and administrative expenses for the years ended June 30, 2018, 2017 and 2016 included non-cash stock-based compensation expense of $1,366,764, $1,180,618, and $1,750,209, respectively.